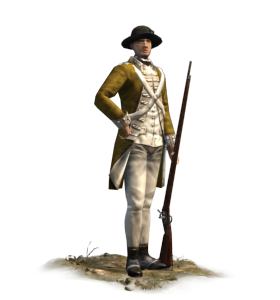 Company infantry are professional soldiers drawn exclusively from Europeans, both officers and other ranks. They are members of private armies for the traders, but one that is available to further national needs when required. They fight using European doctrine and equipment as line infantrymen, carrying smoothbore, muzzle-loading muskets. These soldiers are also enforcers, tax gatherers and a potent threat against the local princes in India, even away the battlefield. Native regiments under European officers exist too, but their reliability is doubtful. Historically, the great European trading companies were often closer to being nations in their own right than business ventures. India was so wealthy that the companies needed armies, not just guards, to protect and expand their interests and prestige. The British East India Company (the “John Company”), the Dutch “Vereenigde Oostindische Compagnie” (VOC) and the French “La Compagnie française des Indes orientales” all had their own armed forces; 1 in 5 VOC employees were soldiers! A national army requires central organisation, if only for pay and rations. Regiments may be the preserve of their commanding officers, but the functionaries control the purse strings!